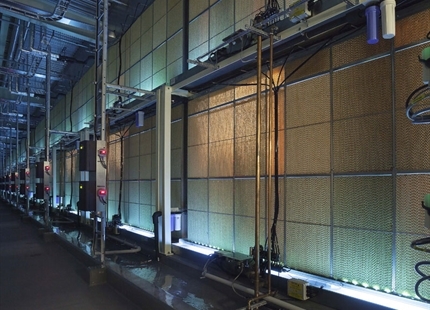 Condair has launched the new Condair ME evaporative humidifier, offering low energy humidification and evaporative cooling to an air handling unit or duct. Its innovative and patented features position it firmly as the World’s leading humidifier of its type. 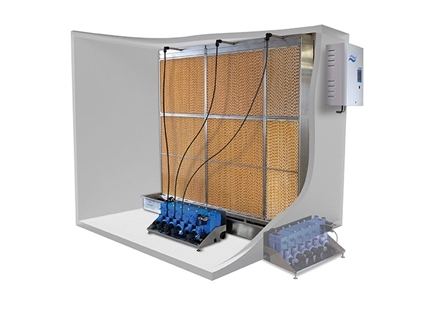 A single unit can deliver up to 1,000kg/hr of moisture and 630kW of evaporative cooling to an air stream while operating on less than 0.3kW of electricity. The Condair ME consists of an evaporative module that is located inside the duct, a patented self-contained hydraulic unit and an intuitive touch-screen control panel. The hydraulic unit pumps water to the top of the evaporative module where it flows down the corrugated surface of its evaporative media. As air passes through the wetted media it is humidified and cooled. 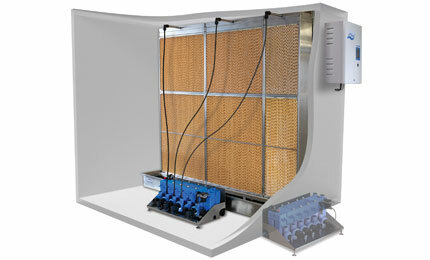 The humidifier’s patented hydraulic unit has many unique features that differentiate the system from other evaporative humidifiers on the market. The compact unit is made of toughened glass reinforced plastic and features a water tank, up to five water pumps and a pumped drain. It can be located either inside or outside of the AHU. Exterior mounting enables all mechanical components to be located outside the duct and most maintenance to take place without any AHU downtime. The system’s water pumps, each incorporating 32W magnetic drive impellors, allow the Condair ME to provide up to five-stage control as standard. Unlike other evaporative humidifiers that use a large single pump, typically needing around 400W, the Condair ME’s multiple low energy pumps keep its energy consumption proportional to the required output. Also, as the Condair ME’s pumps have no mechanically connected parts they provide exceptionally quiet operation that is barely audible. 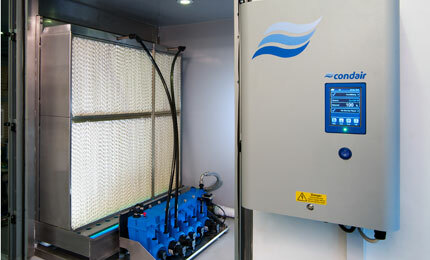 Other features of the Condair ME’s hydraulic unit include a pumped drain that improves humidity control by returning the system to full output more rapidly, water conductivity and temperature sensors, push-fit connections, finger release screws and hand tightened pump mounts for easy servicing. The top of the water tank can be removed in seconds providing access for cleaning without any further disassembly required. The complete hydraulic unit can be quickly disconnected and replaced making the Condair ME ideal for critical applications that demand minimal downtime and redundancy planning. 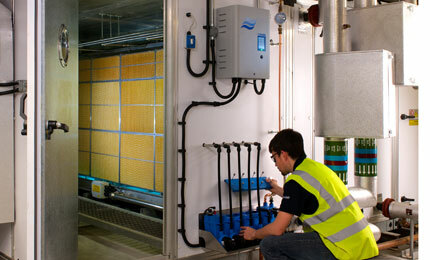 The water tray of the evaporative module, located inside the AHU, can be fitted with a submerged UV water purifier. This provides continuous UV purification to the water flowing around the humidifier and continues to be effective even when there is no demand for humidity control and the pumps aren't operating. 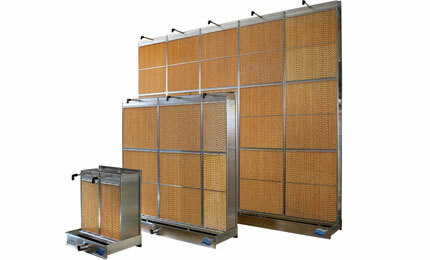 This is a more effective water treatment solution than systems fitted to water supply lines or on re-circulating hoses. Other hygiene features include drain and flush cycles to ensure water cannot remain in the system, double creased tanks to ensure 100% drainage and hydraulic module impregnation with Biomaster antimicrobial additive. A touch-screen control panel with intuitive interface allows software based commissioning and has detailed operational, servicing and fault reporting. It displays current settings and the conditions of air humidity and temperature as well as water temperature, level and conductivity. 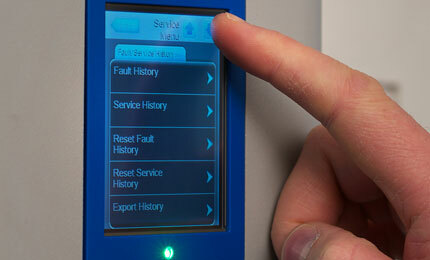 Service requirements and fault diagnostics are displayed and recorded for future reference. This information can be downloaded via a USB port that can also be used to easily update the panel’s software. The control panel can be connected to a BMS. 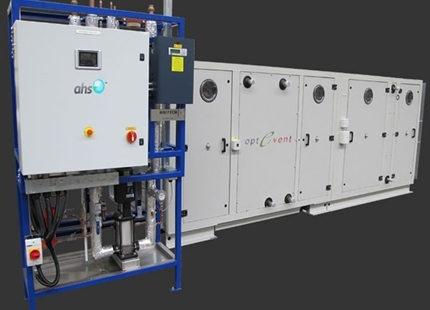 A major benefit of evaporative humidification is that it provides instant evaporation without any required absorption distance in the AHU. This allows it to be fitted in very short section lengths without any risk of wetting inside the duct. 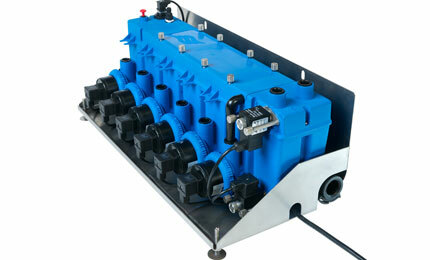 It can run on mains water without the need for RO water treatment. As there is no need to heat the water it can be much more economical to run than electric steam humidifiers. Regular flush cycles remove minerals from the system making this a low maintenance option.